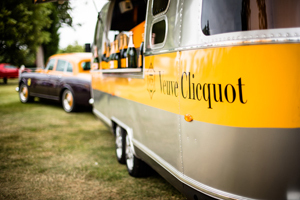 French Champagne house Veuve Clicquot will tour the UK in a branded Airstream trailer with UK rap artiste Tinie Tempah. The ‘party on wheels’ will visit a number of UK events throughout the summer including Festival No. 6 (5-7 September) at Portmeirion, north Wales, Goodwood Festival of Speed (26-29 June) and Polo on the Beach (5 July) at Watergate Bay in Cornwall. Tempah has selected an upcoming music act from his label Disturbing London to perform in the vehicle at each event. This includes music trio All About She, Billon, formed by London music producers Ed Butler and Robbie Lamond, and DJ Charlesy. As part of the tour Tempah will be attending the Veuve Clicquot Gold Cup, held at Cowdray Park on 20 July. Speaking about the tour, Tempah said: "To me, Veuve Clicquot is all about spontaneity - it's about enjoying life and doing so in style. I experienced this first hand at the Veuve Clicquot Gold Cup in 2012, which combined some of my favourite things: a fun crowd, great energy and the English countryside. "I'm excited to be collaborating with Veuve Clicquot this year to support local musical talent throughout the UK, selecting some of the top emerging British DJs to perform in conjunction with the Airstream tour, culminating at the 2014 Gold Cup final." Keep up to date with our latest sport news on our dedicated Sport channel, and on social media via the hashtag #EventSportnews.